Squamous cell carcinoma accounts for more than 90% of head and neck cancers. The male-to-female ratio is 2:1 for cancers of the oral cavity and oropharynx, and cancer of the larynx is nearly 4 times as common in men as in women. A strong association exists between cancers of the upper aerodigestive tract and the use of both tobacco and alcohol. The risk of malignancy is 6 times greater for people who smoke than for those who do not smoke. The synergistic effect of alcohol and smoking increases the risk of disease 2.5 times more than the simple additive risk of either risk factor alone. Other environmental factors also have been implicated in the development of cancers of the upper aerodigestive tract. These include using betel nuts, particularly when mixed with tobacco, which serves as a local irritant of oral mucosa and thereby a stimulant to the formation of malignancies. Wood dust and woodcarving have been implicated in the increased incidence of nasopharyngeal malignancies, as has the ingestion of smoked fish, particularly in parts of Asia. Human papillomavirus (HPV) infection is another factor implicated in the development of aerodigestive malignancies. Patients who present with aerodigestive malignancies often manifest various signs and symptoms. They may exhibit a painless neck mass, which may be the only sign. They may also note nonhealing ulcers in the mouth, loosened teeth, and a change in their dentition or in how their dentures fit. In addition, dysphagia, odynophagia, bleeding, hoarseness, respiratory difficulty, referred ear pain, or weight loss may be present. Infrequently, the first sign of an aerodigestive malignancy is the presence of distant metastases. When present, distant metastases may involve the lung, bone, or liver. The number of patients with aerodigestive malignancies who present with synchronous lesions approaches 10%. The initial workup of a patient with a presumed head and neck malignancy includes a complete history and a thorough physical examination, including visualization of the nasopharynx and larynx. Some have said that physicians are the only people who can look inside a person's mouth and not see the tongue, often looking beyond to the oropharynx. Visualizing beneath the tongue, the buccal mucosa, and the gingivobuccal recesses is of the utmost importance. Bimanual examination of the floor of the mouth and the base of the tongue (behind the circumvallate papillae) is important to evaluate the extent of oral cavity tumors and the involvement of adjacent structures. Visualization of the nasopharynx, base of tongue, oropharynx, hypopharynx, and larynx can be performed by indirect examination with a mirror or by using flexible fiberoptic or rigid endoscopes, which also permit evaluation of vocal cord mobility and patency of the airway. The clinical ability to detect lymph node metastases depends on the extent of the neck metastases and the expertise and experience of the examiner. The traditional treatment of metastatic cervical adenopathy dates back to 1906 and a paper authored by George Crile, Sr. In it, he emphasized the importance of removing the cervical lymph nodes for examination and treatment, since metastases can remain in the cervical lymph nodes for a long period; thus, the radical neck dissection was devised. The operation described by Crile remains the criterion standard to which all modifications are compared. Rouvier initially described the routes of lymphatic drainage in the head and neck in 1938 in his paper entitled "Anatomy of the human lymphatic system." Although many systems have been devised to delineate the regional lymph nodes, most centers treating cancers of the head and neck have adopted the system used by the Head and Neck Service at Memorial Sloan-Kettering Cancer Center (with minor variations from the Head and Neck Service at MD Anderson Hospital in Houston). This system is both anatomic and reproducible from one center to the next. Lymph nodes in the submandibular triangle are considered level I. 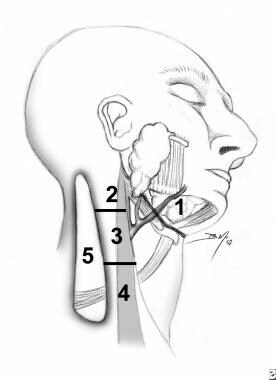 Levels II, III, and IV are the upper, middle, and lower jugular lymph nodes, respectively. Level V includes the spinal accessory and posterior triangle lymph nodes. Level VI lymph nodes are in the tracheoesophageal groove, and level VII lymph nodes are in the superior mediastinum. The levels of metastasis to cervical lymph nodes are illustrated below. Levels of metastasis to cervical lymph nodes. No absolute contraindications exist to radical neck dissection, since it is both a diagnostic and a therapeutic maneuver. Often, the primary tumor metastasizes to the regional lymph nodes and does not progress further. This does not make the tumor incurable. Most surgeons defer performing a radical neck dissection for metastatic squamous cell carcinoma if evidence of distant metastatic disease exists, since the cure rate plummets in this situation. This is not true of metastatic thyroid carcinoma. Even involvement of the common carotid artery (an unusual situation in the untreated neck) or of the skull base is not an absolute contraindication to this surgery. Surveillance, Epidemiology, and End Results Program. SEER Stat Fact Sheets: Oral Cavity and Pharynx Cancer. National Cancer Institute. Available at http://seer.cancer.gov/statfacts/html/oralcav.html. Accessed: May 5 2015. Bocca E, Pignataro O, Sasaki CT. Functional neck dissection. A description of operative technique. Arch Otolaryngol. 1980 Sep. 106(9):524-7. [Medline]. Nutting CM, Morden JP, Harrington KJ, Urbano TG, Bhide SA, Clark C, et al. Parotid-sparing intensity modulated versus conventional radiotherapy in head and neck cancer (PARSPORT): a phase 3 multicentre randomised controlled trial. Lancet Oncol. 2011 Feb. 12(2):127-136. [Medline]. Correa AJ, Burkey BB. Current options in management of head and neck cancer patients. Med Clin North Am. 1999 Jan. 83(1):235-46, xi. [Medline]. Mehanna H, Wong WL, McConkey CC, et al. PET-CT Surveillance versus Neck Dissection in Advanced Head and Neck Cancer. N Engl J Med. 2016 Apr 14. 374 (15):1444-54. [Medline]. [Full Text]. Bernier J, Cooper JS, Pajak TF, van Glabbeke M, Bourhis J, Forastiere A, et al. Defining risk levels in locally advanced head and neck cancers: a comparative analysis of concurrent postoperative radiation plus chemotherapy trials of the EORTC (#22931) and RTOG (# 9501). Head Neck. 2005 Oct. 27(10):843-50. [Medline]. Candela FC, Kothari K, Shah JP. Patterns of cervical node metastases from squamous carcinoma of the oropharynx and hypopharynx. Head Neck. 1990 May-Jun. 12(3):197-203. [Medline]. Fee WE, Goepfert H, Johns ME, Strong EW, Ward PH, eds. Head and Neck Cancer, vol 2. Philadelphia, Pa: BC Decker; 1990. Kramer S, Gelber RD, Snow JB, Marcial VA, Lowry LD, Davis LW, et al. Combined radiation therapy and surgery in the management of advanced head and neck cancer: final report of study 73-03 of the Radiation Therapy Oncology Group. Head Neck Surg. 1987 Sep-Oct. 10(1):19-30. [Medline]. Laramore GE, Scott CB, al-Sarraf M, Haselow RE, Ervin TJ, Wheeler R, et al. Adjuvant chemotherapy for resectable squamous cell carcinomas of the head and neck: report on Intergroup Study 0034. Int J Radiat Oncol Biol Phys. 1992. 23(4):705-13. [Medline]. O'Brien CJ. A selective approach to neck dissection for mucosal squamous cell carcinoma. Aust N Z J Surg. 1994 Apr. 64(4):236-41. [Medline]. Robbins KT. Indications for selective neck dissection: when, how, and why. Oncology (Williston Park). 2000 Oct. 14(10):1455-64; discussion 1467-9. [Medline]. Self EM, Bumpous J, Ziegler C, Wilson L, Potts K. Risk factors for hemorrhage after chemoradiation for oropharyngeal squamous cell carcinoma. JAMA Otolaryngol Head Neck Surg. 2013 Apr. 139(4):356-61. [Medline]. Shah JP. Patterns of cervical lymph node metastasis from squamous carcinomas of the upper aerodigestive tract. Am J Surg. 1990 Oct. 160(4):405-9. [Medline]. Shah JP, Medina JE, Shaha AR, Schantz SP, Marti JR. Cervical lymph node metastasis. Curr Probl Surg. 1993 Mar. 30(3):1-335. [Medline]. Disclosure: Received none from Allergan for speaking and teaching; Received none from LifeCell for consulting; Received grant/research funds from GID, Inc. for other.